Brief history of KCCI from their website. 8th and Pleasant Studio and KRNT Theatre photos. KCCI program log - noon block heading log body August 26, 1983 From Eric Wylie. Dolph Pulliam button courtesy of Eric Wylie. 1980's newsroom and studio pictures with explanation. In front of CBS Hollywood Bob Day, Don Sears and Bob Ogburn. KRNT-TV going all color with local news Newspaper ad - February 6, 1967. Mary Jane Chinn Popular KRNT-TV personality of the 50's and 60's - newspaper ad. 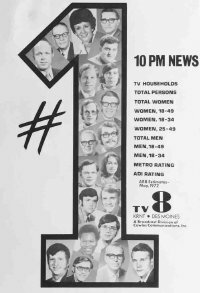 1974 KCCI pictures courtesy of Don Sears. 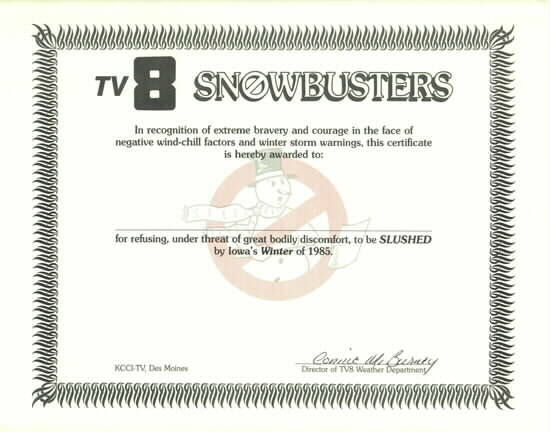 1985 TV-8 "Snowbusters" certificate from TJ Fox. KRNT-TV News Staff -- 1960 Presidential election night "Kennedy/Nixon." KRNT gives Iowans their first preview of television - Iowa State Fair - 1946. 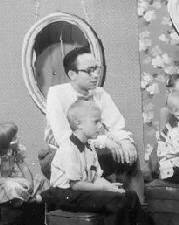 Russ Van Dyke on personalities page. 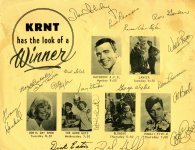 KRNT Radio and TV Personalities 40's to 60's. Ralph Powers Cartoon Capers Show 1950's.